The Captain Peel Walk at Sandy Walking RouteA walk around Sandy to commemorate the 150th Anniversary of Captain Sir William Peel's Death passing many buildings associated with the Captain. BY BUS Telephone Bedfordshire Bus Information Line : 01234 228337, 8.30am 5pm open 5 days a week or Travel Line 0870 6082608. BY TRAIN For timetable information, please telephone National Rail Enquiries 08457 484950. 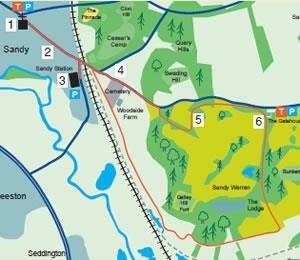 How To Get There By Car: Sandy is at the junction of the A1 and A603. From Bedford, take the A603. Car parking is available in the town centre and the railway station. Start/Finish Point: This circular walk begins at St Swithun's Church on the High Street in Sandy, and finishes on the High Street just past the railway station. Public Toilets: There are public toilets next to the car park in the town centre and at the RSPB, please see the map. A walk around Sandy to commemorate the 150th Anniversary of Captain Sir William Peel's Death passing many buildings associated with the Captain.